Today’s first of two rounds of Daytona 500 practice was a relatively benign affair, with no serious incidents around the 2.5-mile Daytona International Speedway. Brad Keselowski, one of the favorites to win Sunday’s Daytona 500 (2 p.m. ET, FOX) lost the left-rear brake rotor in his No. 2 Team Penske Ford during the session. But Keselowski was able to nurse his car back to the garage, where the team was able to make repairs. 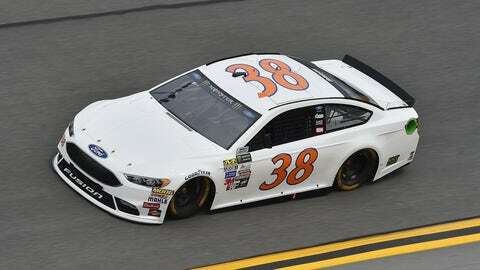 Although drafting makes it hard to put much stock in individual speeds posted in practice, David Ragan was on top of the speed charts, with a best lap of 194.898 miles per hour in his Front Row Motorsports Ford. Behind Ragan came the Hendrick Motorsports Chevrolets of Kasey Kahne and Chase Elliott, followed by Ryan Newman’s Richard Childress Racing Chevy. Then it was Jimmie Johnson and Dale Earnhardt Jr. in the other two Hendrick Chevys. Today’s second and final practice runs from 3-3:55 p.m., with live television coverage on FS1. 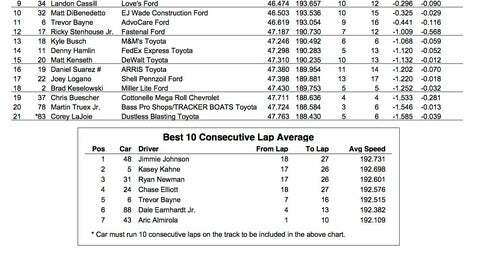 Check out the full practice results from the first Daytona 500 practice below.